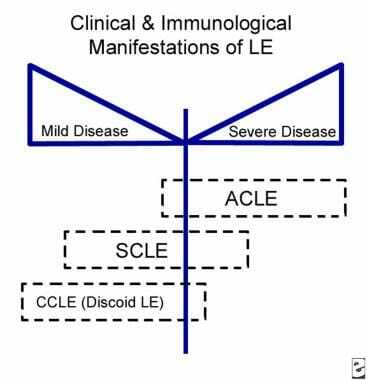 Relationship of acute cutaneous lupus erythematosus (ACLE) to systemic disease. LE is lupus erythematosus. CCLE is chronic cutaneous lupus erythematosus. SCLE is subacute cutaneous lupus erythematosus. See Cutaneous Clues to Accurately Diagnosing Rheumatologic Disease, a Critical Images slideshow, to help recognize cutaneous manifestations of rheumatologic diseases. Erythema involving the malar area, forehead, and neck. Note sparing of some of the creases. ACLE can be transient, lasting for several days to weeks. Lesions wax and wane with sun exposure over a period of several hours; however, some patients experience prolonged disease activity. The etiology of lupus erythematosus is believed to be multifactorial, involving genetic, environmental, and hormonal factors. An association with human leukocyte antigen DR2 and human leukocyte antigen DR3 has been identified. Concordance in monozygotic twins and familial associations support a genetic basis in acute cutaneous lupus erythematosus. More than 25 genes have been identified as contributing to the mechanisms that predispose patients to lupus. They include alleles in the major histocompatibility complex region (multiple genes): IRF5, ITGAM, STAT4, BLK, BANK1, PDCD1, PTPN22, TNFSF4, TNFA1P3, SPP1, some fc gene receptors, and deficiency in several complement components, including C1qC4+C2. In patients who are predisposed genetically, exposure to natural ultraviolet radiation is a frequent precipitating factor for lupus erythematosus. In addition, certain viruses (eg, Epstein-Barr virus, cytomegalovirus, human immunodeficiency virus [HIV]) have been implicated in precipitating or exacerbating lupus erythematosus in genetically predisposed individuals. Chemicals such as L-canavanine, which is present in alfalfa sprouts, have been known to induce systemic lupus erythematosus (SLE)–like illness. Drugs implicated in inducing a lupus erythematosus–like illness (eg, procainamide, isoniazid, hydralazine) typically do not induce acute cutaneous lupus erythematosus (ACLE). See also Bullous Lupus Erythematosus, Discoid Lupus Erythematosus, Drug-Induced Lupus Erythematosus, and Subacute Cutaneous Lupus Erythematosus. Data concerning direct immunofluorescence in ACLE are sparse. In one study, the results of 5 (100%) of 5 skin biopsy specimens were reported as positive for the lupus band test. The lupus band test reveals the presence of immunoglobulins and C3 complement components along the dermoepidermal junction. All three immunoglobulin classes (IgG, IgM, IgA) and a variety of complement components have been identified at the dermoepidermal junction. Research has shown that 60% of patients with a malar eruption of lupus erythematosus have positive lupus band test results. In nonlesional skin, positive lupus band test results correlate strongly with an aggressive course of systemic disease. Precise data concerning the prevalence of acute cutaneous lupus erythematosus (ACLE) in specific racial groups are not available; however, since photosensitivity is observed more frequently in whites than in blacks, the same prevalence for ACLE may be inferred. Estimates suggest that 1 in 250 black women in the United States and the Caribbean and 1 in 1,000 Chinese persons have SLE. Although lupus erythematosus may be rare in most parts of Africa, data concerning this finding conflict. Data concerning ACLE are difficult to interpret, since a lack of conformity is found in the description of lesions and biopsy data are lacking for skin lesions observed in patients with systemic disease. Significant morbidity and potential mortality are associated with systemic lupus erythematosus (SLE), of which acute cutaneous lupus erythematosus (ACLE) is a manifestation. 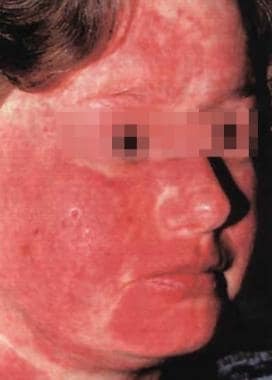 The malar eruption tends to wax and wane with systemic activity; however, whether the presence of malar rash indicates a worse overall outlook for patients has not been determined. No definite correlation has been identified between ACLE and nephritis; however, localized lesions of ACLE are believed to tend to wax and wane, paralleling the underlying systemic disease. Postinflammatory hyperpigmentation may occur in dark-skinned patients following resolution. Educate patients about the nature of skin, which acts as a barometer of disease activity. Control of the cutaneous manifestations depends ultimately on overall control of the disease. Instruct patients regarding the effects of ultraviolet light in exacerbating the disease. For patient education information, see the Arthritis Center, as well as Lupus (Systemic Lupus Erythematosus). Petri M, Orbai AM, Alarcón GS, et al. Derivation and validation of the Systemic Lupus International Collaborating Clinics classification criteria for systemic lupus erythematosus. Arthritis Rheum. 2012 Aug. 64 (8):2677-86. [Medline]. Renner R, Sticherling M. The different faces of cutaneous lupus erythematosus. G Ital Dermatol Venereol. 2009 Apr. 144(2):135-47. [Medline]. Moghadam-Kia S, Chilek K, Gaines E, et al. Cross-sectional analysis of a collaborative Web-based database for lupus erythematosus-associated skin lesions: prospective enrollment of 114 patients. Arch Dermatol. 2009 Mar. 145(3):255-60. [Medline]. [Full Text]. Grönhagen CM, Fored CM, Granath F, Nyberg F. Cutaneous lupus erythematosus and the association with systemic lupus erythematosus: a population-based cohort of 1088 patients in Sweden. Br J Dermatol. 2011 Jun. 164 (6):1335-41. [Medline]. Gallego H, Crutchfield CE 3rd, Lewis EJ, Gallego HJ. Report of an association between discoid lupus erythematosus and smoking. Cutis. 1999 Apr. 63 (4):231-4. [Medline]. Durosaro O, Davis MD, Reed KB, Rohlinger AL. Incidence of cutaneous lupus erythematosus, 1965-2005: a population-based study. Arch Dermatol. 2009 Mar. 145 (3):249-53. [Medline]. Parodi A, Cozzani E. Cutaneous manifestations of lupus erythematosus. G Ital Dermatol Venereol. 2014 Oct. 149 (5):549-54. [Medline]. Mandelcorn R, Shear NH. Lupus-associated toxic epidermal necrolysis: a novel manifestation of lupus?. J Am Acad Dermatol. 2003 Apr. 48 (4):525-9. [Medline]. Torchia D, Romanelli P, Kerdel FA. Erythema multiforme and Stevens-Johnson syndrome/toxic epidermal necrolysis associated with lupus erythematosus. J Am Acad Dermatol. 2012. 67(3):417-21. [Medline]. Ziemer M, Kardaun SH, Liss Y, Mockenhaupt M. Stevens-Johnson syndrome and toxic epidermal necrolysis in patients with lupus erythematosus: a descriptive study of 17 cases from a national registry and review of the literature. Br J Dermatol. 2012. 166(3):575-600. [Medline]. Ting W, Stone MS, Racila D, Scofield RH, Sontheimer RD. Toxic epidermal necrolysis-like acute cutaneous lupus erythematosus and the spectrum of the acute syndrome of apoptotic pan-epidermolysis (ASAP): a case report, concept review and proposal for new classification of lupus erythematosus vesiculobullous skin lesions. Lupus. 2004. 13(12):941-50. [Medline]. Bielsa I, Guinovart RM, Fernández-Figueras MT, Rodríguez C, Ferrándiz C. Cutaneous lupus erythematosus on the elbows: a peculiar localization. 2012. 21(1):84-8. [Medline]. Jerdan MS, Hood AF, Moore GW, Callen JP. Histopathologic comparison of the subsets of lupus erythematosus. Arch Dermatol. 1990 Jan. 126(1):52-5. [Medline]. Böckle BC, Stanarevic G, Sepp NT. Detection of Ro/SS-A antibodies in lupus erythematosus: what does it mean for the dermatologist?. J Am Acad Dermatol. 2013 Mar. 68(3):385-94. [Medline]. Cortés-Hernández J, Torres-Salido M, Castro-Marrero J, Vilardell-Tarres M, Ordi-Ros J. Thalidomide in the treatment of refractory cutaneous lupus: prognostic factors of clinical outcome. Br J Dermatol. 2011 Oct 16. [Medline]. Raptopoulou A, Linardakis C, Sidiropoulos P, Kritikos HD, Boumpas DT. Pulse cyclophosphamide treatment for severe refractory cutaneous lupus erythematosus. Lupus. 2010. 19(6):744-7. [Medline]. Chasset F, Bouaziz JD, Costedoat-Chalumeau N, Francès C, Arnaud L. Efficacy and comparison of antimalarials in cutaneous lupus erythematosus subtypes: a systematic review and meta-analysis. Br J Dermatol. 2017 Jan 23. [Medline]. Goodfield M, Davison K, Bowden K. Intravenous immunoglobulin (IVIg) for therapy-resistant cutaneous lupus erythematosus (LE). J Dermatolog Treat. 2004 Jan. 15(1):46-50. [Medline]. Kok MR, Vos K, Bos JD, Tak PP. Remission of incapacitating acute cutaneous lupus erythematosus in a patient with systemic lupus erythematosus by B cell-depletive therapy. J Clin Rheumatol. 2010 Oct. 16(7):345. [Medline]. Uthman I, Taher A, Abbas O, Menassa J, Ghosn S. Successful treatment of refractory skin manifestations of systemic lupus erythematosus with rituximab: report of a case. Dermatology. 2008. 216(3):257-9. [Medline]. Vital EM, Wittmann M, Edward S, Md Yusof MY, MacIver H, Pease CT, et al. Brief report: responses to rituximab suggest B cell-independent inflammation in cutaneous systemic lupus erythematosus. Arthritis Rheumatol. 2015 Jun. 67 (6):1586-91. [Medline]. Ky C, Swasdibutra B, Khademi S, Desai S, Laquer V, Grando SA. Efficacy of Intravenous Immunoglobulin Monotherapy in Patients with Cutaneous Lupus Erythematosus: Results of Proof-of-Concept Study. Dermatol Reports. 2015 Mar 16. 7 (1):5804. [Medline]. Pisoni CN, Obermoser G, Cuadrado MJ, et al. Skin manifestations of systemic lupus erythematosus refractory to multiple treatment modalities: poor results with mycophenolate mofetil. Clin Exp Rheumatol. 2005 May-Jun. 23(3):393-6. [Medline]. Simsek I, Cinar M, Erdem H, Pay S, Meric C, Dinc A. Efficacy of plasmapheresis in the treatment of refractory toxic epidermal necrolysis-like acute cutaneous lupus erythematosus. Lupus. 2008. 17(6):605-6. [Medline]. Kuhn A, Gensch K, Haust M, et al. Efficacy of tacrolimus 0.1% ointment in cutaneous lupus erythematosus: a multicenter, randomized, double-blind, vehicle-controlled trial. J Am Acad Dermatol. 2011 Jul. 65(1):54-64, 64.e1-2. [Medline]. Díez MT, Boixeda P, Moreno C, González JA, Zamorano ML, Olasolo PJ. Histopathology and immunohistochemistry of cutaneous lupus erythematosus after pulsed dye laser treatment. Dermatol Surg. 2011 Jul. 37(7):971-81. [Medline]. Sondhi P, Bhari N, Taneja N, Gupta S. Transplantation of In Vivo-Harvested Epidermal Cell Suspension for Acute Cutaneous Lupus Erythematosus-Induced Depigmentation. Dermatol Surg. 2017 Mar 13. [Medline]. Kuhn A, Ruland V, Bonsmann G. Photosensitivity, phototesting, and photoprotection in cutaneous lupus erythematosus. Lupus. 2010 Aug. 19(9):1036-46. [Medline]. Ding C, Foote S, Jones G. B-cell-targeted therapy for systemic lupus erythematosus: an update. BioDrugs. 2008. 22 (4):239-49. [Medline]. Winchester D, Duffin KC, Hansen C. Response to ustekinumab in a patient with both severe psoriasis and hypertrophic cutaneous lupus. Lupus. 2012 Aug. 21 (9):1007-10. [Medline].